Our Arts Development and Experience CLA programs have worked jointly to put together a new dance troupe, which, after two months of rehearsals, will develop an original narrative dance piece. From 19 April 2018, their new piece Earth & Sky will be performed on stage at the CLA Theater at the National Museum of Cambodia. We are launching this platform to support the development of professional artists, in collaboration with VOAN Savay as Artistic Director, and Prince SISOWATH Tesso as Artistic Advisor. As well as regular employment, the troupe will benefit from working with top directors, networking opportunities, and regular personal and professional development training. Members of the troupe receive a salary, and be on a 14-month renewable contract. 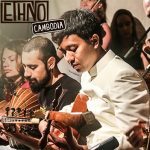 Their work will also include giving workshops that introduce local and international audiences to Cambodian dance. To book tickets for the new show, please click here. COPYRIGHT ©2017, CAMBODIAN LIVING ARTS - ALL RIGHTS RESERVED.